It appears I was the first person to successfully use the Myki vending machine at Bentleigh station, back on the first of last year. Hardly surprising as few people in Melbourne had a card at that point. And this afternoon I got Sales Transaction ID number 3370, when I dumped a bunch of change onto my card. Note the chopped-off Myki logo on today’s receipt — it’s not an error scanning it, but some kind of printing/alignment error. Incidentally today’s receipt is on a thicker form of thermal paper than that used originally. Fascinating, I’m sure you’ll agree. Back then, as now, if you perform an EFTPOS/credit card transaction, if you say you don’t want a receipt, it’ll issue one. If you say you do want a receipt, it’ll issue two. Masterful. Next → Next post: Double awesome! 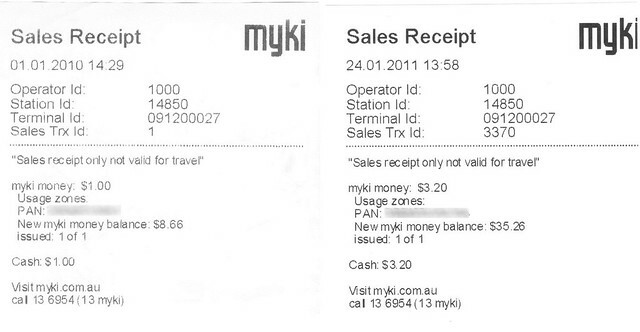 Because one is a EFTPOS receipt, and one is the myki sales receipt? Not since tram conductors disappeared has there been such a useful thing to dump unwanted small change into. Any time you have too much change, dump it onto your Myki card. I assume if you pay by cash at a machine the credit is immediately available to us . Is the PAN your CC number? If so, that’s an immediate fail for PCI compliance. @Ronnie, yes. Why they can’t print the EFTPOS receipt and the Myki sale on the same bit of paper, I don’t know. @Andrew2, no, the PAN is the Myki card number. In both the cases above, it was a cash transaction. @Andrew no matter which way you choose to add credit on at a myki machine it’s immediately available. When I checked last week Hawthorn had done about 6500 on the plat 1 machine. Melbourne centrals two machines had done about 90000 between them. Shell petrol stations are the same. For some unexplained reason, they print an EFTPOS receipt without the sales details on it, though of course the price is there, and without the ABN and the words ‘tax invoice’. They ask you if you want a tax invoice. If you say yes, out comes a second piece of paper with the same info as the first but also the required tax invoice details. Other petrol stations and traders of various types are able to get this right; why are some incapable? Gee, 3370 transactions seems kind of modest. Averaging <10 per day. Ha! Not that I've actually paid much attention to that before. Just fetched my most recent one, from 22/1 (and maybe a dozen stations further down the same line). it has a remarkably similar Sales Trax ID: 3409. I’m just wondering whether the “sales receipt only…” bit could go on the Unnecessary Quotation Marks blog? There’s also a missing comma in there. Thermal paper turns out to exude Bisphenol A, a chemical which mimics Estrogen in humans, and which is quite readily absorbable through skin like fingers. Here in Canada, Bisphenol A has been banned in baby bottles (not so in Australia, according to Wikipedia). There was a tremendous amount of fuss, leading up to the ban. Many water bottles painted inside with epoxy paint turned out to be tainted with the stuff as well. They, too, have been withdrawn and replaced with bottles labeled prominently as “Bisphnenol Free”. After all that, it was discoved last year (or more properly, exposed) that thermal paper such as is used for the vast majority of receipts is laden with the stuff as well. FYI. Your mileage may vary. @ace, Bisphenol A is known in Australia as BPA, and many are looking out for drink bottles that exclude it, but its other applications are not well known.